a vehicle.a skull is -19 inches above the vehicle.the skull is leaning 30 degrees to the north.a 1st 6 feet tall witch is behind the vehicle.a 1st 6 inch tall mushroom is right of the skull.a 2nd 6 inch tall mushroom is left of the skull.the skull's eye is red.the skull's nose is green.a 1st bag is right of the witch.a man is left of the vehicle.a flat wall is behind the witch.the wall is [horror].a 2nd bag is in front of the man.the 2nd bag is facing north.shiny ground.the man's shirt is black.a bomb is 12 inches right of the vehicle.the ground is grass.the wall is 1 inches in the ground. the yellow light is -10 inches in front of the jack o lantern. it is night. It is dawn. The ground is transparent. The giant skull is shiny white. The skull is 90 inch above the ground. The tiny gray helicopter is in front of the skull. 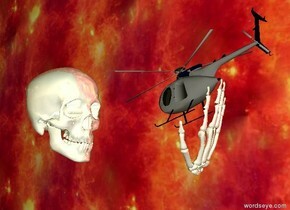 The skull is facing the helicopter. The helicopter is facing the skull. The helicopter is 20 inch in front of the skull. The helicopter is 100 inch above the ground. the helicopter leans forwards. The upside down giant shiny hand is -25 inch under the helicopter. The hand leans forwards. The hand is -50 inch behind the helicopter. The camera light is white. The enormous unreflective wall is fire. The wall is -20 feet away from the skull. The wall is next to the skull. The wall is facing the skull. The wall is above the ground. There is a pumpkin on the ground. 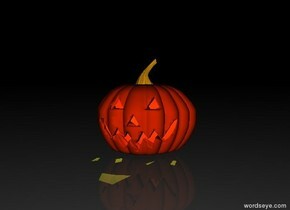 There is a skull to the left of the pumpkin. It is leaning 90 degrees to the right. 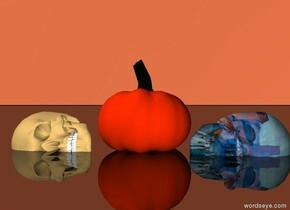 There is a matisse skull to the right of the pumpkin. It is leaning 90 degrees to the left. The ground is shiny black. The sky is coral. the large witch is 5 feet in front of the haunted house. the large cat is 3 feet in front of the house. the witch is 5 feet above the cat. 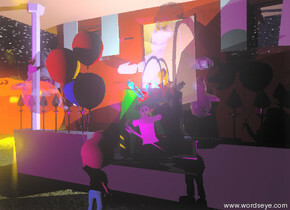 the house is on the very tall klee mountain range. a green light and a orange light are above the cat. a tree is right of the house. a huge pumpkin is a foot left of the cat. it is night. the large [candy] gun is on the shiny [fall] mountain range. 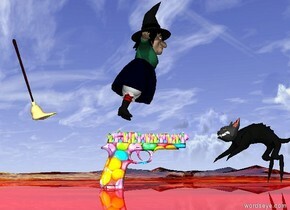 a small witch is 2 inches above the gun. she is leaning forward. 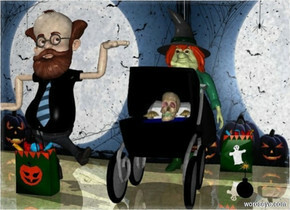 the small broom is a foot behind the witch. it is facing front. It is leaning backwards. the cat is 6 inches in front of the gun. it is facing the gun. it is leaning backwards. house is on the ground. the ground is grass. the ghost is -7.5 feet in front of the house. it is 2.7 feet above the ground. it is 60% transparent. the tiny white illuminator is inside the ghost. the small ghost is next to the ghost. it is 1 feet in front of the ghost. the tiny mauve illuminator is in the big bag. the big bag is -3 feet in front of the house. it is 1 feet above the ground. it is 25% transparent. the tiny ghost is 4.1 feet to the right of the small ghost. it is 20% opaque. the unreflective boy is 1 feet in front of the house. he is facing the house. 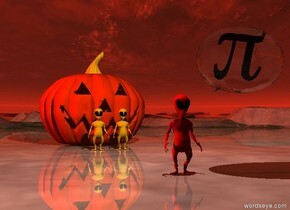 the small orange illuminator is inside the very huge pumpkin. the large black cat is on the very huge pumpkin. the small purple illuminator is 30 feet in front of the very huge pumpkin. the very huge pumpkin is 4 feet to the left of the house. it is 70% opaque. the camera light is 20% black. it is night. 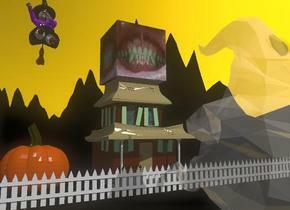 the haunted house is on the black mountain range. the mountain range is 130 feet tall. the mountain range is 200 feet wide. the enormous pumpkin is 4 feet to the left of the house. the sky is orange. the large witch is 10 feet above the pumpkin. the ground is black. the white picket fence is 3 feet in front of the house. the fence is 70 feet wide. The shiny white ghost is in front of the fence. the ghost is 20 feet tall. the transparency of the ghost is 30%. there is a enormous mouth on the house. The stone floor is on the mountain range. 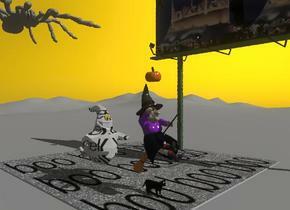 A black cat is on the stone floor.The "boo" texture is on the floor.The witch is above the cat. 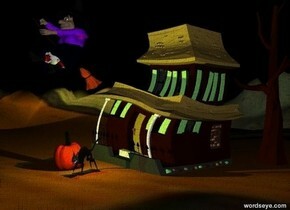 the pumpkin is above the witch. a white "Rockwell" ghost is 3 feet behind the cat. the ghost is 1 foot above the floor. the sky is orange. The impi-29 billboard is 10 feet to the right of the cat. The billboard is facing left. the 3 foot tall spider is 4 feet behind the ghost. the spider is 19 feet above the ground.